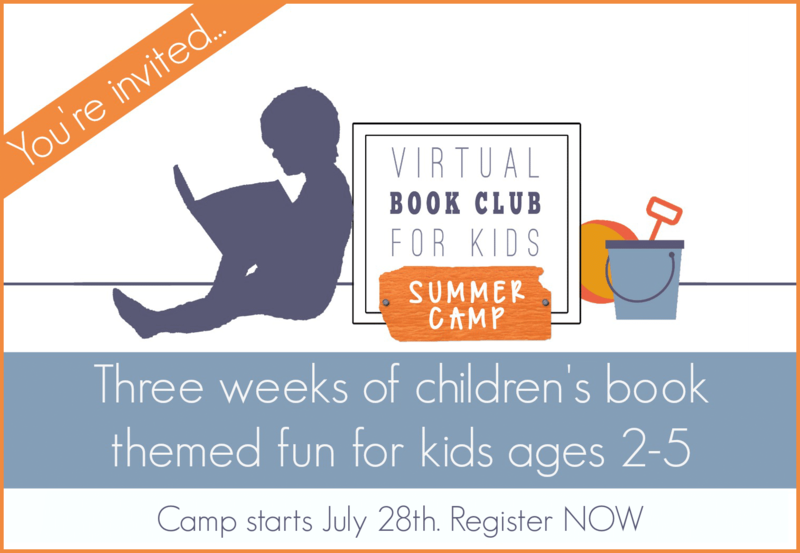 UPDATE: Join us for the 2015 Virtual Book Club Summer Camp! Click here for info! In June over 450 moms, grandparents and caretakers joined us and it was amazing – for 3 weeks we shared crafts and activities based around 3 fun child hood themes perfect for 2 – 5 year olds. Connecting and creating with books that the children loved and enjoyed them bringing the books alive for the children. So we’re launching a second session perfect if you missed the first session and you can register now. This years summer camp your camp directors are myself – Kim from The Educators’ Spin On It , Kristina from Toddler Approved and Cerys from Rainy Day Mum, – we are all Mom’s and former teachers and the crafts and activities we have brought together have been tried and tested by our own children in our virtual book club summer camps at home. This Second Session is suitable for NEW MEMBERS of the Virtual Book Club Summer Camp not for members of the sessions that started in June 2014. You can chose to follow exactly the plan or you can spread out the activities over as long as you want – newsletters with all the details for the following week will be sent to your email address (the one you use in your registration process) but you can save, print and do the activities when you want. 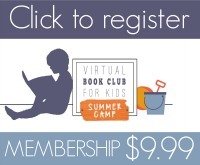 Registering to become and member of this second session of the popular Virtual Book Club Summer Camp is very easy – for a small fee of $9.99 you get the 3 weeks of planned activities for you to do at home, newsletters containing supply lists, snack ideas, book lists, song ideas, adventure ideas and printables to download as well as membership to the exclusive Facebook group for this second session of The Virtual Book Club Summer Camp 2014. To register you just click the button below or use this link and you can join us creating and connecting with books this summer. IMPORTANT NOTE: THE NEWSLETTER WILL BE SENT TO THE EMAIL YOU USE FOR PAYPAL. PLEASE MAKE SURE IT IS THE CORRECT EMAIL YOU WOULD LIKE TO USE. NO EMAIL CHANGES WILL BE MADE ONCE YOU REGISTER. Note: Registration is via Paypal but you don’t have to use a Paypal account to register. You can also just use your credit card. Please contact us with any questions regarding payment at virtualbookclubforkids@gmail.com. 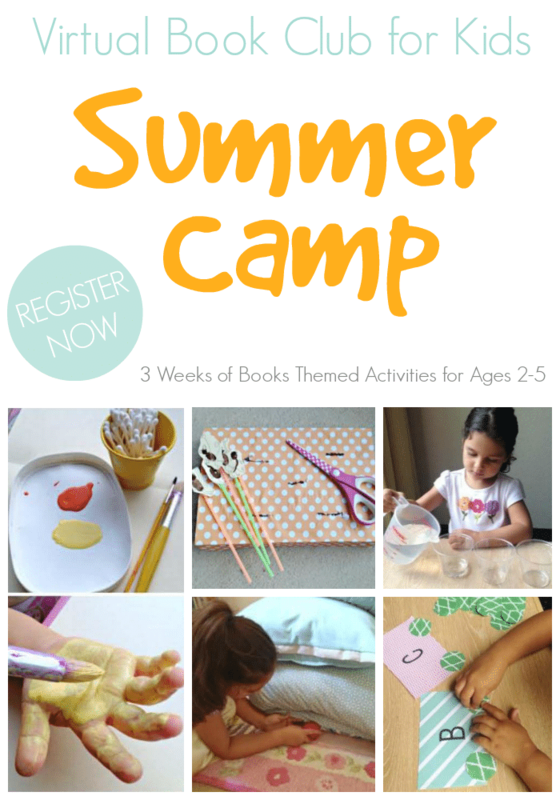 Every activity in our VBC Summer Camp will be simple, have easy to get materials, and will be geared towards kids ages 2-5. I can’t wait! Hope to see YOU at camp this summer!